There is nothing more important for a beginner racquetball player than knowing how to choose a racquetball racquet. Every racquetball player knows that. If you pick the right one from the start, you are sure to improve a lot. What racquet should I choose? Which one should I go for? Is this the right one? These are some of the most common questions a player faces while choosing a racquetball racquet. If you are reading this, that means you want to know how to choose a racquetball racquet. We will keep this article as simple as possible. Without further ado, let’s get straight to business. 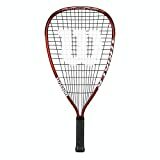 Don’t feel like reading, check out my top pick for the best racquet for playing racquetball. 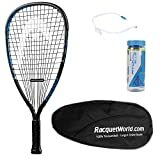 To improve yourself as a racquetball player and to have fun while playing, you need to choose the right racquet from the start. Now there are four main components for choosing the right racquet. These are Head size, Weight, Grip, and Power. These are the basic criteria you need to keep in mind. Before I go into details on those criteria, if you are a beginner perhaps the safest way to determine the racquet for you is to try out a demo one. Many stores offer a demo program. You can take the demo racquet at home and play with it. The purpose of this program is to make sure you like what you see before buying the actual product. If you don’t feel like using a demo one, then just continue reading this article. By the end of this guide, you can easily determine which one will be the best for you. Let’s start with the most important criteria of them all. It might surprise you but in our opinion, we think the grip size is the most important component when picking a racket. Racquetball racquets come in three different grip sizes. Why do we think that the grip size is the most important component of choosing a racquet? Well, the racquet could be perfectly balanced, specs are all perfect, perfect weight but if the grip size doesn’t fit your hand, you are going to find it uncomfortable. You are not going to be able to play with it at your highest potential. So, what’s the most popular grip size? No.1 is the answer. About 80% of players use the 35/8. Why? Because it’s the smallest grip size out there, it fits an average hand, it maximizes wrist snap and power. Now, if you have larger hands, the other two options are for you. You might want to keep in mind that it’s 20% of the average population that use large grip size. If you want to maintain a solid grip, have a look at the best racquetball gloves buyers guide that I recently published. You determine the swing weight of the racquet by your swing speed. Basically, heavier racquet means more power and precision. If you are new to racquetball game, go for something on the heavier end. If you still want to know more about different swing weight groups, head over to our best racquetball racquet buying guide for more details. Our suggestion for a first-time player would be to go for a medium swing racquet. It’ll weigh between 170 – 175g. There are also other racquets that weigh more than 180g. Do keep in mind that you’ll be holding the racquet throughout the entire game. You don’t want something that’ll tire out your arms quickly. Here is a good beginner’s racquetball racket. 170g swing weight is the most popular because it fits right in the middle of that racquet swing spectrum. Head shape or size, there are two types of them. There is Quadroform and Tear Drops. The difference is in the sweets pot of the string bed. The Quadroforms sweet spot is a little bit lower and a little bit wider. A teardrops sweet spot has a higher sweet spot. Don’t get too confused about which type you should choose. This is all about personal preference. Try both, you’ll eventually know which one suits more to your playing style. The last component is the balance. Technically there are plenty more other components to look out for, but for a beginner, we don’t want to make your buying decision any more difficult than it already is. For now, stick to the basics. There are three balance points. Don’t worry, we’ll explain them in a moment. These three balance points determine where most of the weight lie. 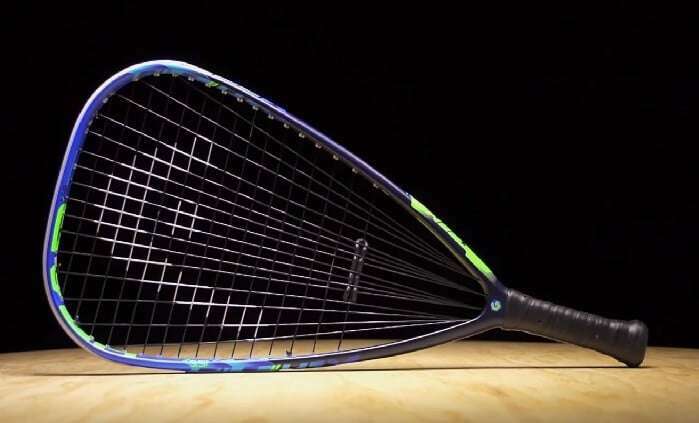 The average racquetball racquets weigh in 3 – 5pts HH (Head Heavy). This is preferred for a beginner, because you want to contact the ball higher in the string bed, higher on the racquet’s frame. You want a little extra weight up there to transfer that extra energy to the ball. If you prefer more power, look for something that has 3-5pts HH. This is a middle range racquet in terms of balance. There are also higher balance points racquets but start with this range. If you want to know more about balance points, head over to our best racquetball racquet buying guide. We also want to mention some other additional factors. Like price, brands, grips, strings, materials. But it’ll just make you more confused. Again, to keep it simple, go for the brand names. They are usually more trustworthy than your average racquetball racquet manufacturers. It’s always safe to go for popular brands on the market because you can be sure they will offer you only the best to stay at the top of the manufacturing line. In terms of price, if you are a budget constraint and don’t want to do the hard part of researching, why not head over to this link here pick the best one for your buck. As we said before, there are other factors to consider but this should be enough for you to get started. Selecting the right one requires a little bit of research on your end. Feel free to come back and check this site for a more updated version of this topic. If you have any other queries regarding How To Choose A Racquetball Racquet, do let us know in the comments section below.